For many years, one choir has attracted attention even beyond the national borders with unconventional concert forms and specially designed projects. On their third recording for Gramola, Johannes Hiemetsberger and his Chorus sine nomine devote themselves to a work of the classical vocal repertoire: the German Requiem op.45 by Johannes Brahms. Nevertheless, both the work itself with its German text and a focus on consoling the bereaved and especially Hiemetsberger�s decision to record the composer�s own version for piano four hands, which places greater emphasis on the choir, must be termed unconventional. So the Chorus sine nomine, with Elena Copons, soprano and Adrian Er�d, baritone, as well as the piano duo of Johanna Gr�bner and Veronika Trisko, again manage to produce something very special. 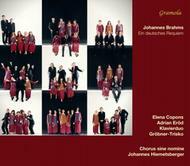 Founded by Johannes Hiemetsberger in 1991, the Chorus sine nomine ranks among Austria�s leading vocal ensembles. Numerous first prizes at major choir competitions and CD productions testify to the quality and significance of the cause closest to the heart of the Chorus sine nomine - the cultivation of a capella music in all its diversity.